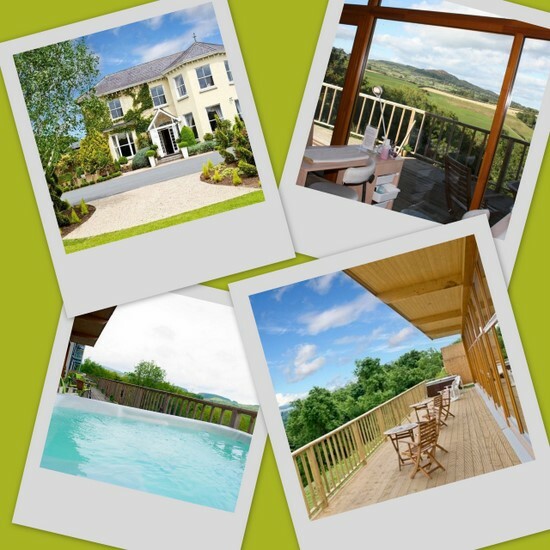 From top left: Summerhill House Hotel; view from Rainforest Day Spa; outdoor hot-tub; balcony (with hot-tub at very end). This weekend I enjoyed one of the best massages of my life, at the Rainforest Day Spa. (The others, if you're interested, were from Elaine Butler Doolin and at the Hotel Barsalini on the island of Elba!). Rainforest is set in the grounds of the picturesque Summerhill House Hotel, close to the charming wee village of Enniskerry in Co. Wicklow. Though it's just 30 minutes outside Dublin, it's surrounded by the gorgeous greenery of the Wicklow mountains, which can be enjoyed at leisure from the spa's balcony and outdoor hot-tub. I went with friends for a belated birthday treat and we opted for the Rainforest Renew package at €99 each, which included a Swedish back massage, Yonka facial, brow shape, mini manicure and use of the sauna, steam room and hot-tub. The facial felt a little rushed, the mani and brow treatments were grand, but the massage was really something special. Though it lasted just half an hour it felt much, much longer and left me feeling deeply relaxed and, yep, renewed. It was administered, somewhat unusually in Ireland, by a man, the very efficient Daniele, who thoroughly smoothed all of the kinks and tension out of my back and shoulders. He encouraged me to focus on three things: breath (and I could match his breathing or set my own pace), touch, and releasing tension. Very quickly I fell into what was almost a meditative state and when the treatment was complete I could have slept for hours. It's worth keeping an eye on the special offers on their website and I'll also be checking out the specials offered by the Summerhill House Hotel; we've already agreed that next time, we're definitely staying overnight! What was the best massage of your life? Tell me in the comments! Sounds gorgeous, can you believe I've never had a massage in my life! Looks a great place to unwind. Sounds great - I really need to try the spa as this is where I'm getting married! That sound divine!! You lucky girl! That sounds so amazing! Men are supposed to be better at massages because they are stronger. I really want to go now- maybe when I'm home in the Summer! I used to get massages quite regularly at home but haven't had one since I moved, because I don't really know where to start looking for a good place... I miss them and I reckon my back is definitely suffering! Holy Moly that looks yummy! I need to redeem my gift for a massage! I'm sad to say I've never had a proper massage in my whole life. It sounds really nice, though. Really want to go here looks so fab!! !